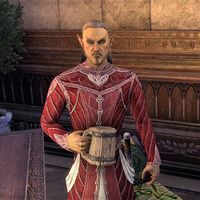 Lirendel is an Altmer who can be found in Alinor. You'll first encounter him near the northwest gate berating an Orc named Roguzog. Lirendel : "You would challenge me to a duel? How droll." Lirendel : "But then, how can we have a proper contest? You don't even know the Altmer code of dueling, do you?" Lirendel : "Learn the rules and challenge me properly. Then I'll teach you some manners." "Fairly met, nebarra. To what do I owe this profound pleasure?" "Honor and praise, cerum. Can I help you with something?" The Orc you insulted wants to face you in a duel. What does he need to do to make that happen? "Oh, for Stendarr's sake—that business. I won't apologize for speaking the truth. That Orc is an uncivilized, gloveless buffoon. I'd sooner duel a frog. Or a tea kettle. But, if he insists on facing me, he'll need to learn our dueling customs." "I suggest he read our Guide to Altmeri Culture. He can read, can't he? There's a copy just there on the table. If he meets the preconditions and notifies my second, Fandilol, I promise to duel that filthy glan'nt at the determined place and time." "We have nothing more to discuss. Give your stumpish friend that book—or don't. It makes little difference to me." Can you remind me what our Altmer dueling customs entail? "You've forgotten our rites of martial contest? How sad. The Guide to Altmeri Culture contains a full accounting of the rules. It's there on the table." "If the Orc meets the preconditions and notifies my second, Fandilol, I will accept his challenge." "I honestly can't fathom why you're helping that tusk-faced brute. Some kind of misguided charity mission? These nebarra are like idiot children, friend. If you want to train something, get a dog." "If you are here to help that pig-faced brute challenge me, speak to my second, Fandilol." Lirendel : "Let's get this over with, shall we?" Roguzog : "Yeah, let's do that. C'mere fancy pants." This page was last modified on 29 January 2019, at 12:36.